LED hoop sale, lessons, classes, discount, poi Crazy Deals | Flamebuoyant Productions, Inc. I guess you can call it spring cleaning…we’re offering some crazy deals on products and services this month! Our next session of classes is on mega-sale! Register with a friend for a whopping 50% off the second class! Now is the perfect time to revamp your practice or learn a new trick before festival season starts! Just use the coupon code “buddy” on checkout to save $50! 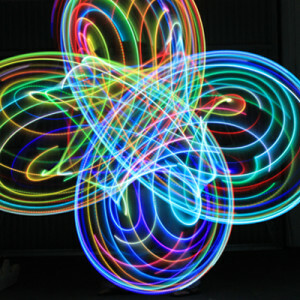 We’ve also slashed prices on our stock of LED hoops. Normal retail value for these fabulous, durable 30LED hoops is $125+, we’re selling them now for only $85, with local pick up available in Portland. That’s a savings of $40! No coupon code necessary, but the sale is limited to stock on hand. If you follow us on Facebook you would know that we’re hosting former Cirque du Soliel fire performer Srikanta Barefoot for a staff/dance fusion workshop on March 6. Unfortunately, spaces filled up fast and it’s too late now to register now. Connect with us electronically to be the first to get news that doesn’t make it into the newsletter! And, of course, we are back to giving private lessons in our newly renovated home studio. Just get in touch to set up a lesson for poi, fans, hoop, stilts, acro or whatever other circus skill your heart desires to learn!